I had serious worries about today, Day 3 of my Appalachian Trail adventure. Near the end of yesterday's 11 mile hike I was really dragging--achy, hobbling along, just trying to survive those last couple of miles. I don't like to dwell on aches and pains, so didn't mention this in yesterday's entry. But overnight I didn't sleep well. I woke up still achy and generally exhausted. And I was confronted with a 14.4 mile 'do it all or fail' day. Today I had to hike out 7.2 miles to a point in the middle of nowhere (Brickey's Gap) with no road access any closer. So if I failed, I'd have to do the whole 14.4 miles again another day. To top it off, the weather today was looking terrible. All of you who live in the mid-Atlantic know what I mean. The wind was brutal, the temperatures never got above the low 20's, and snow flurries continued all day. This was not a day to overextend myself and get stuck out in the middle of nowhere all alone and unable to get back. But I'm not one to back away from a challenge or easily give up my goals. I was going to give it a shot. And I had a plan. As I prepared to head out at first light, I took some of my 'magic bullet' drug of choice and hit the trail before sunrise. Didn't feel too bad at first--I usually do OK for the first few miles. At Mile 1 I passed a young couple who camped the frigid night in Johns Spring Shelter. They were unprepared and underdressed - just out from the parking lot to camp then maybe go to McAfee Knob and then return to their car - they're on a road trip, not a hike. I didn't lecture them, but told them what the weather was going to be like up on the Knob - brutal wind chills well below zero. Seeing how I was dressed, I guess they took the hint and decided to just head back to their car. I saw no one else the rest of the day. Now back to the main subject. I had brought my miracle drug with me. I took some more. 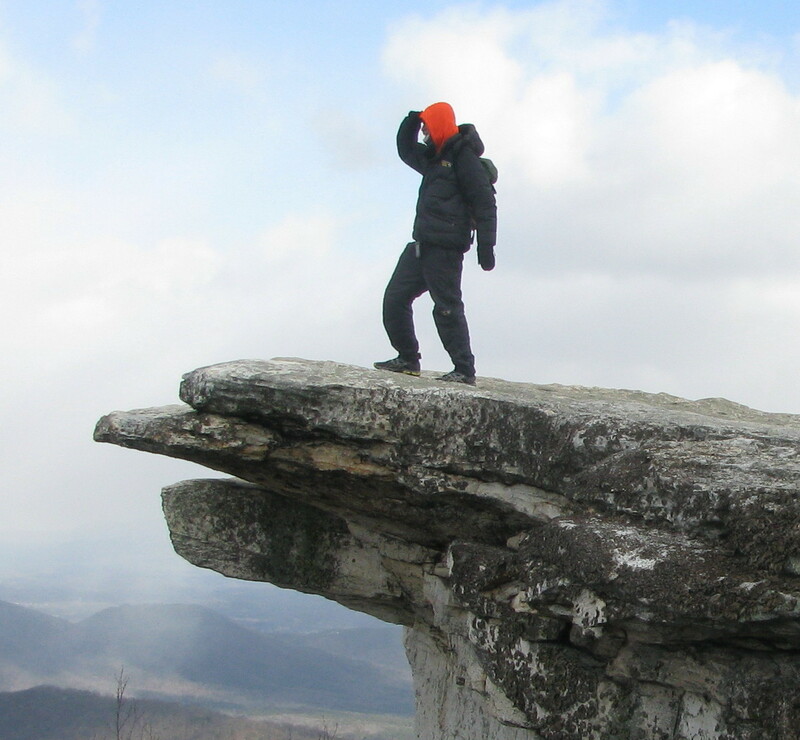 The climb up McAfee knob was still a serious effort, and the winds were even worse than I had expected. I almost turned back. But I persevered. Coming down the other side of McAfee I was in the wind shadow of the mountain and had a couple of miles of fairly pleasant weather down to Campbell Shelter. Then the wind returned as I traversed the spine of Tinker Ridge. My hands were in pain from the cold. Time for more of my wonder drug. By the time I turned around at Brickey's Gap and headed back, the effect of the drug was becoming really noticeable. I found myself singing out loud and powering my way back up to McAfee Knob at a pace faster than I had descended (my footprints in the snow were farther apart on the way up than those I had left on the way down). I felt really strong, despite having already hiked ten miles today - in fact I had not felt better all day. All because of liberal doses of my precious drug. I pumped a couple more doses before reaching McAfee Knob again. There wasn't anybody else there to take my picture - that classic pose that is an Appalachian Trail rite of passage - so I set my camera on ten-second delay and raced like a banshee around the cliff edge to get into the pose. Never mind the hundred foot drop, I wanted that shot! In yesterday's condition I would have been dragging myself over the Knob, just trying to make it home, with no energy to set up and take this photo. So I have my miracle drug to thank for a WILDLY successful day. This drug works. There's no doubt about it. Yes, it's addictive, but I highly recommend it to anyone who wants to extract the most out of their body in physically demanding situations. What is this drug? Some call it DHMO - dihydrogen monoxide. Some call it Hydrogen Hydroxide. Most people call it water. Water? Yes, water can perform the miracle that happened to me today. Last night I suspected, and looking at my paltry output of dark pee early this morning I confirmed: I had gotten myself very dehydrated during yesterday's 11 miles. There's a cardinal rule that I learned first hand in my mountaineering excursions - You can lose huge amounts of water in cold dry air like we've had here the past couple of days. And the body functions orders of magnitude better when you pay attention to keeping fully hydrated. The difference is like night and day. After today's 14.6 miles I felt infinitely better than I did at the end of yesterday. Water truly is the elixir of the gods - and my drug of choice. So that's my tale of Day 3. Not many Appalachian Trail thru-hikers hit the iconic McAfee Knob on their third day out. I hope it's not all downhill from here. I love those natural highs! I crunched some numbers this evening. I've now covered 19.5 trail miles both ways in 3 days. I need to average 6 miles a day to finish - that's twelve miles out and back every single day for 366 days - taking no days off. It's a pretty big undertaking, but after today's rejuvenation, I feel up to it.